Delhi, Jaipur, Ramgarh, Bharatpur, Agra, Rishikesh, and more! Immerse yourself in India’s adventurous wild side on our gay India adventure vacation, including whitewater rafting, hiking, and yoga. 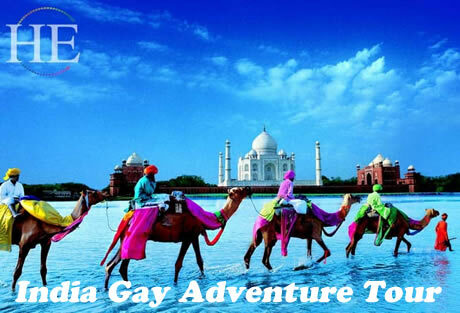 Visit exquisite temples, palaces, and landmarks (including the Taj Mahal), experience rich local culture, enjoy exotic cuisine, and ride camels and elephants on a friendly gay group tour! Biking, Hiking, Rafting... and of Course: the Taj Mahal! Lots of tour companies visit the vast subcontinent of India to see its many treasures, but only HE Travel immerses you into India’s adventurous wild side! 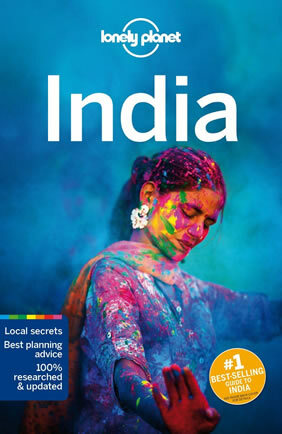 Our gay India Adventure tour begins in Delhi where we delve into the local culture and are swept away to another time and place. Delhi, India’s modern capital, is also a very ancient city filled with hundreds of historic landmarks. From Delhi, we start our active adventuring by visiting the local villages and experiencing rural Indian life; this gives us the opportunity to experience the age-old culture and traditions that Indians have followed for centuries. Later we start cycling towards Jaipur and get the opportunity to witness the feudal legacy that lives on in this region. Enjoy elephant trekking combined with hiking between the forts and palaces of this spectacular region. As we bike through neighboring farming villages, we will provide endless entertainment to local villagers that are intrigued by westerners riding bikes through India! We’ll explore the villages by foot and jeeps, and even take a camel safari! From Jaipur to Bharatpur we will enjoy an afternoon exploring Keoladeo Ghana National Park, a small but important bird Sanctuary. 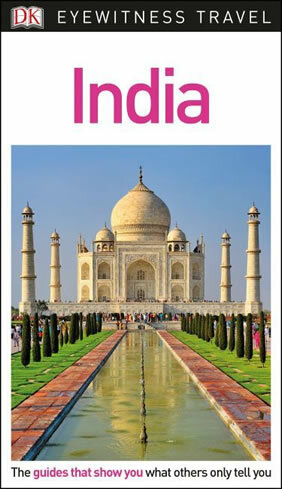 Next, we’re off to Agra to tour the famous icon of India, the Taj Mahal. Our HE Travel tour group will not only visit the Taj Mahal itself, but we will take a nature walk through the 9 km of trails which zigzag through the grounds. This allows us to see this monument from several glorious vantage points; the Taj has variations in hue, color, and radiance with respect to time, season and setting. 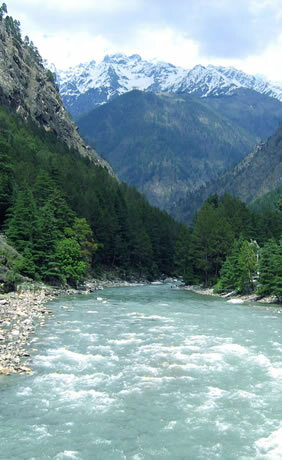 Our last stop will be Rishikesh, considered by many to be the “Yoga Capital of the World”. This is where the real adventure happens, whitewater rafting, hiking, and of course...yoga! Guests arriving in Delhi will be met and transferred to our lovely hotel. Delhi is made up of seven ancient cities, spanning the 11th to 20th centuries. The region has seen the rise and fall of many emperors who left thousands of monuments commemorating the grandeur and glory of bygone ages. Very few cities in the world can boast such a profusion of architectural styles. Due to late arrivals there are no activities or group meals planned today. After breakfast this morning, we will walk the streets of Old Delhi with a private guide and be immersed in India’s history. Gain a new understanding of the country’s ancient cultures while seeing life at the local level. Learn about the impressive design of the city’s ‘Havelis’ (private mansions), discover the significance of historical sites like the Red Fort, and admire handmade crafts sold at the market in Chandni Chowk. By walking the same paths that the locals do, you’ll be genuinely immersed in the Old Delhi lifestyle. Lunch today will be on your own. This afternoon we will visit New Delhi, which was designed and built by the British in the 1920's. It’s a city of wide boulevards, impressive government buildings, as well as green parks and gardens. We will also visit a monument from Delhi’s past – Humayun’s Tomb. This evening we will visit Gurudwara Bangla Sahib; one of the most prominent Sikh temples. Your drive takes you along the ceremonial avenue, Rajpath, past the imposing India Gate and Parliament House. We will dine together this evening at a delicious restaurant in town for our Welcome Dinner. 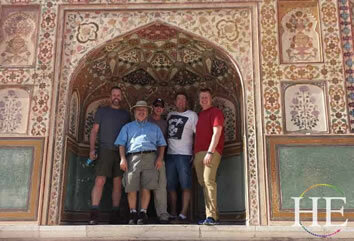 Today we will head to our hotel in Jaipur; with historic forts, palaces, and gardens. On the way to Jaipur, we’ll see the evidence of lucrative trade routes over the Thar Desert: remains of luxurious palaces, temples, and forts built by successive rulers (including Hindu Rajputs and Muslim Mughals). A feudal legacy lives on here, in ornate pleated veils, voluminous turbans, tinkling bells, and mirrored saris – all symbols of an exotic past. This is a great destination for shopping, with outstanding values in textiles, jewelry, metals, and precious stones. This afternoon, we will explore Galta Ji; a large Hindu temple complex. Enjoy these temples that are home to a large colony of monkeys, which has led to its nickname, the monkey temple. In the evening we will enjoy a thrilling jeep safari to see the city at night. Take in the views of Albert Hall, Hawa Mahal(Wind Palace) Birla Mandir and Jal Mahal. The drive will continue onto Amber Palace with the breathtaking display of lights on the majestic building. Tonight we’ll have the evening to explore and have dinner independently. 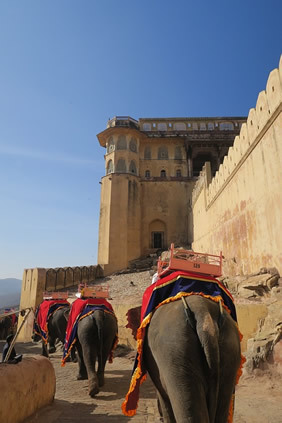 This morning we will make our way to Amber Fort, a spectacular fortress that protects a complex of palaces, temples and exquisite marble and mirror halls and apartments. From here we will hike for 2 hours (7km) to Jaigarh Fort and Nahargarh Fort, which overlooks the city of Jaipur. 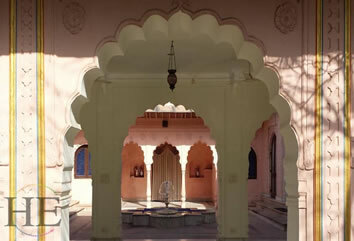 With fantastic views, a beautiful palace complex and a uniquely designed stepwell. As you ascend, you will have beautiful vies of the valley, covered in dense forest and streams. 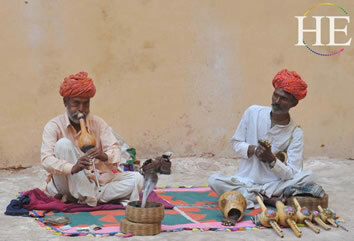 Later tonight; we will have the option of learning about the Rajasthan’s traditional art of block printing. This process flourished since the 12th century when the art received royal patronage from the kings or the era. Departing through the outlying settlements of Jaipur and with the Amber Fort as our backdrop, we commence the cycling. By noon, we arrive at Ramgarh Lake and enjoy lunch under a huge Banyan tree. After lunch, we explore the village on foot and Jeep. Guests may enjoy an optional camel ride this evening before shuttling back to our Jaipur hotel. Dinner tonight will be on our own. After breakfast, we will make a morning drive to Bharatpur in order to explore Keoladeo Ghana National Park, a small but important bird sanctuary. Originally a duck-shooting preserve, the wetland is now a world-renowned birding destination. We’ll walk or take a cycle along the narrow road to the open wetlands at the end. We’ll then make our way to Agra, once the capital of the Moghul Empire, and check in to our hotel. The remainder of the day is free. Feel free to enjoy the grand, Bollywood style live performance “Mohabbat-e-Taj” based on the love story of Taj Mahal. After breakfast, we will explore Shah Jehan’s monument to love. The Taj Mahal was built by the Mughal emperor as the final resting place for his favorite Queen, Mumtaz. This perfectly symmetrical monument took 22 years (1630-1652 A.D) of hard labor and 20,000 workers, masons and jewelers to build. It was designed by the Persian architect, Ustad Isa. The verses of the Holy Quran are inscribed on it and at the top of the gate’s 22 small domes, signifying the number of years the monument took to build. The elegant dome of the Taj has a diameter of 60 feet, and directly under the dome is the tomb of Mumtaz Mahal. Fantastic inlay work, using semi-precious stones, decorates the exterior and interior. 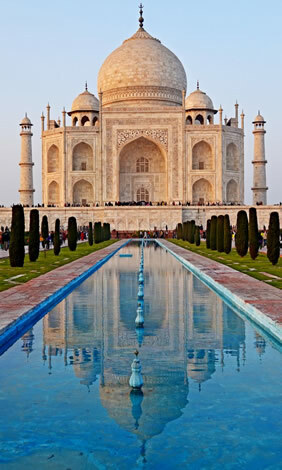 This evening we will gain breathtaking views of the ‘Monument of Love’—the Taj Mahal—during a walk around the grounds. This lovely path takes around 45 minutes to complete and traverses a lovely grassland area that showcases native thorny and broad-leaved trees. From elevated grassy mounds, we’ll enjoy the beauty of Taj Mahal from different directions, as the colors shift subtly with the changing daylight. We’ll enjoy dinner together tonight in Agra. Join the optional yoga and meditation session before sunset at the lovely hillside overlooking the Taj Mahal. Today we drive from Delhi to Rishikesh, which calls itself ‘Yoga Capital of the World’. The ashram offers all kinds of yoga and meditation classes, surrounded by forested hills, soothing and tranquil for mind expansion. There are opportunities for crystal healing in this gorgeous location, known also as the gateway to treks in the Himalayas. This morning, the day will begin with a spiritually refreshing yoga and meditation session to start the day off balanced. After breakfast, we will suit up for a morning of whitewater rafting. Before we arrive here, let’s stop for a bit at Shivpuri for some rock climbing! Then we will enjoy the light river rapids with our expert guide! We will enjoy lunch together and a little relaxing before we head out for our next activity. The adventure continues this afternoon, as we head out to hike the Mala Kunti Trek; an enjoyable hike into the mountains. After a full day of adventure; we will enjoy dinner together at a local Rishikesh restaurant. After breakfast, we will begin our day with a full day trek to Kunjapuri Temple, one of the most revered Hindu shrines. 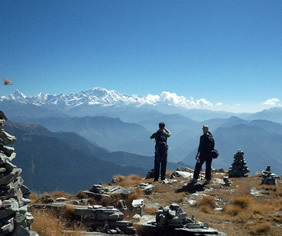 As we trek through green forests we will have spectacular views of the snowcapped mountains of the Himalayas. There are 290 stairs on along the way; so we will take our time and enjoy a day out in nature. From the temple, we will enjoy views of Haridwar, Rishikesh and Doon Valley. This evening we will make our way to the Ghats of the Ganges River and enjoy the Aarti Ceremony, which is part of the evening puja(prayers). As the Aarti fire ceremonies take place, bells are run and the chanting/singing provides a fascinating, magical and spiritual closure to the day. We will then enjoy our farewell dinner together. Today we will fly from Rishikesh to Delhi for connecting flights home. In Dehli, a few day rooms are available for a shower or brief rest before your connecting flight. After a tour full of exotic adventure and outdoor activities, we’ll all head home with lifetime memories and cameras full of colorful images. This tour starts and ends in Dehli, India. During our time in India, we will spend a good portion of each day walking, hiking, or trekking on uneven urban streets and village roads, on trails, and on hilly terrain. We’ll ride elephants and bicycles, practice some yoga, and enjoy rock climbing and whitewater rafting in a beautiful and exotic setting. To fully enjoy this tour you should be in good physical shape and able to walk around unevenly paved ancient sites for 1-4 hours each day. So are most of the people who travel with us. You do not need to pay extra to travel by yourself. Prices are per person, and the single supplement applies only if you’d like a room by yourself.